The new Ann Arbor Mini Maker Faire website is at http://annarbor.makerfaire.com/. Find updates on the 2017 faire and more! Please print and share our poster where you work, eat, and hangout. here, and is about 4 Mbytes. If you want to print a bigger or higher resolution version, we have a 20 MB version here. Submit your exhibit for the 2014 Ann Arbor Mini Maker Faire! Just click on the “Makers” tab at the top of this page, or go to the Makers page for more information. See you at the faire! Congratulations to the prize winners! Maker Media kindly provided prizes to be awarded at random among folks who registered for the faire at Eventbrite. Congratulations go to Karl, Chris, and Melinda, who each receive a year’s subscription to Make Magazine, and to Go, who receives a $50 gift certificate for the Maker Shed. Thanks again to all who came out to the faire! We’ll shortly be announcing the date and new location for 2013. Electrolysis Detonators! Robots! Gatling-Gun Vortex Cannons! Gak! Scientific Sirens! 3D printers! More Robots! A Climb-Inside Truncated Icosahedron! Make this Saturday Awesome! Come to the faire! Register to be eligible for door prizes! We just got the list of door prizes! Click on the “Register” button to the right and enter your information to be eligible. There is no cost to register, but you must register to be eligible for the prizes. 2 winners for a one-year magazine subscription to Make Magazine. 1 winner for a family pass to World Maker Faire New York. Thanks to Make for these great door prizes! Space for a few more Exhibitors! We do have space for a few more exhibitors–email us at tendrid@gmail.com. Thanks! Can you put our poster up at your work and where you hang out? Can you announce the fair at meetings and clubs you attend? Click here to download our poster. Thanks! Call for Makers! Deadline is May 21. 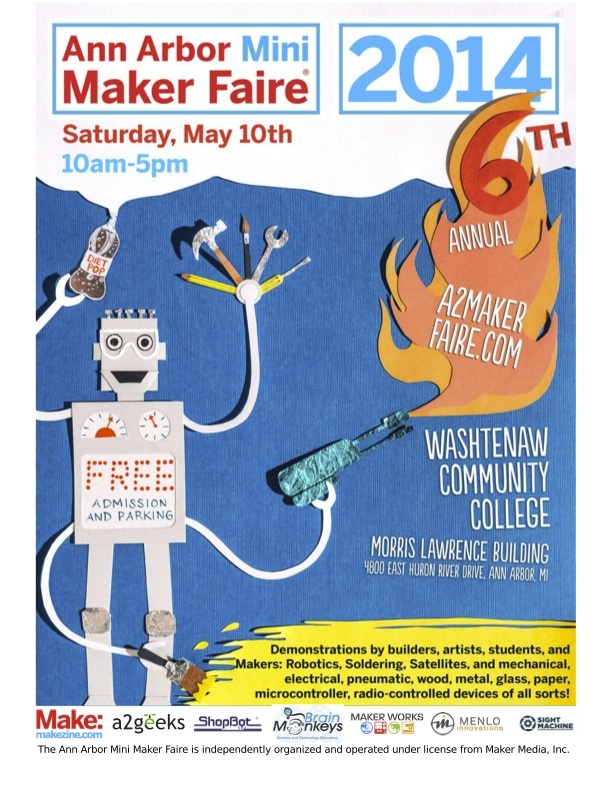 We are excited to announce the Call for Makers for the 4th Ann Arbor “Mini” Maker Faire, to be held Saturday June 2, 2012, at the Washtenaw Farm Council Grounds, Ann Arbor, Michigan. The Faire features exhibits and activities in robots, green tech, science, radio, rocketry, unusual tools/techniques, fixing and/or taking things apart, and other areas, all with an emphasis on “do it yourself.” Last year’s Faire drew over 1,400 people to engage in activities such as learning to solder and silk screening t-shirts, and saw exhibits such as hearing the neural activity of a cockroach leg, a giant “Simon Says” game, a DIY satellite to test an ion engine in space, pop-up books with a master of paper folding, gigantic vortex cannon, robots galore, computer vision, and much more. Apply now to be an exhibitor! Additional information and an online application form are at http://www.a2makerfaire.com. The application deadline is May 13, 2012. The Faire is free to exhibitors and visitors alike. It is organized by the group a2 geeks (http://www.a2geeks.org), a newly organized Ann Arbor area non-profit foundation promoting the informal technology culture in the greater Ann Arbor area. The Faire is a local, community version of the major Maker Faires in the Bay area and in New York City. The mission of the Ann Arbor Mini Maker Faire is to present interesting or unique exhibits, individuals, and demonstrations in DIY science, technology, engineering, and art that excite, motivate, and educate. The emphasis is on cool things, skills, and knowledge. As a shorthand, the exhibits should be the kind of thing you’d see in Make Magazine. RSVP for a chance to Win! Please print and share the 2016 poster! Be sure to check out the Detroit Maker Faire! 2016 Call for Makers is now live! Ann Arbor Mini Maker Faire is independently organized and operated under license from Maker Media, Inc.